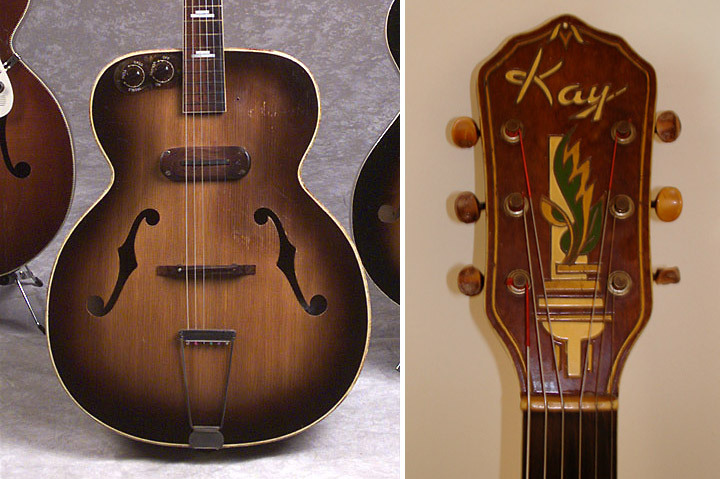 Throughout most of the 1900s, the Kay Musical Instrument Company was a true behemoth of the American guitar market. Based in Chicago, the company’s output was impressive, surpassed only by the Harmony Company (also based in Chicago). The Kay Company had a significant impact in the history of guitar making in the USA, and the company always had a plethora of guitars in just about every price range and style. Founded in 1890, the company originally operated as The Groeschel Company and manufactured mandolins. In 1918 the company name was changed to the Stromberg–Voisinet Company and added guitars and banjos to the lineup. Then, in 1928, new owner Henry Kay Kuhrmeyer changed the name to the Kay Musical Instrument Company and began to focus on all types of stringed instruments, like basses and violas and guitars. Kay also made guitars under a few different brand names, such as Silvertone, Truetone, Airline, and Old Kraftsman, among others. Looking through old Kay catalogs can be a dizzying task, with hundreds of different guitar models and configurations. But for the purposes of this article, let’s take a look at some of the more memorable and emblematic models produced by one of the largest guitar makers in US history. 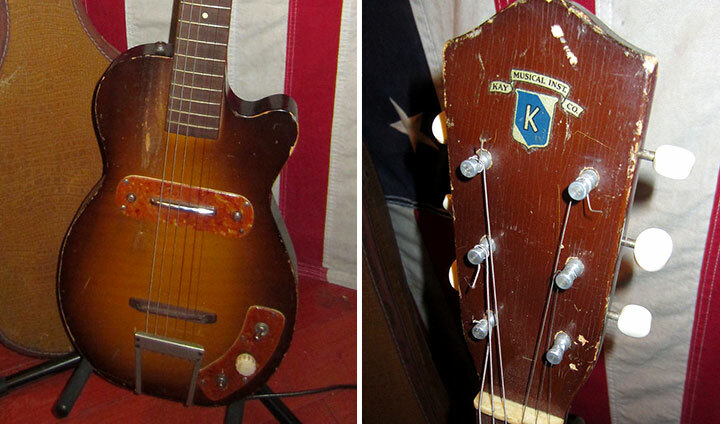 This is a great example of the early electric guitars by the Kay Co. This K–158 was called the Electric Spanish Guitar. It was listed in catalogs as a standard model featuring a large 17” body and wonderful little accents, like a spruce top, curly maple back, mahogany neck, binding, and an engraved headstock face. The early pickups featured on it can sound surprisingly strong. One of these “standards” cost $97.50 in 1950 and could also be purchased with a matching amp for an extra $100 — roughly $2,020 altogether in today's dollars. Introduced in the 1952 Kay catalog, the new K–161 was featured as the newest development in electric guitars. The guitar was still large but much thinner at 2–¾” deep with a hollow construction. Advertised as the “Thin Twin” it was a favorite of bluesman Jimmy Reed and was produced under a few different brand names, including Silvertone (sold through Sears catalogs). The Thin Twin had a curly maple top and back combined with mahogany sides. Today, it's sort of funny to read about the new “innovations” of this model, such as two pickups, an adjustable truss rod, and a 3–way selector. 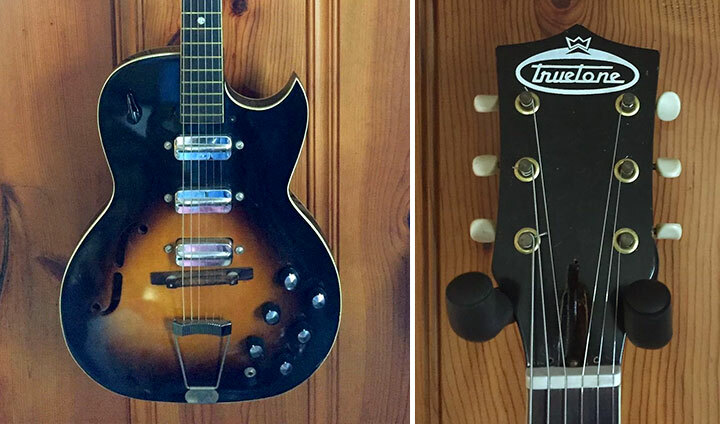 Costing $125 at the time ($1,140 today), these guitars had a solid run throughout the 1950s. With the Thin Twin being the flagship Kay electric of the time, the most affordable model was the K–125. These were full–scale guitars at 25–¾”, but the entire guitar was only 37” long. This model featured the same pickup as the Thin Twin but had a solidbody with a tone switch for two different sounds. They only cost $49.50, with an extra $6 for a case (about $500 today). 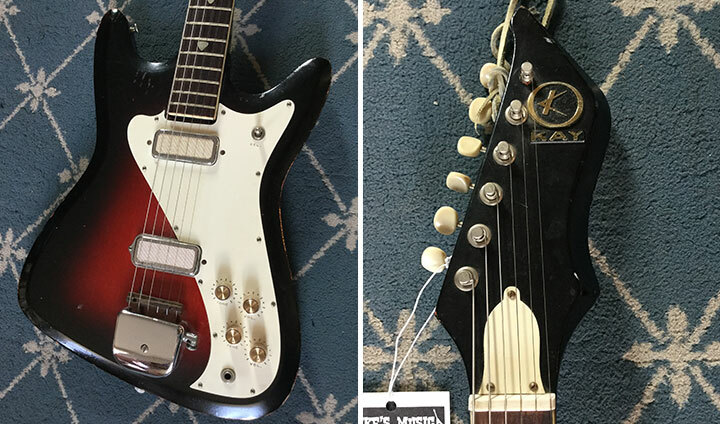 These early small–bodied electrics really blurred the lines between lap steel guitars and what we think of today as standard electric guitars. 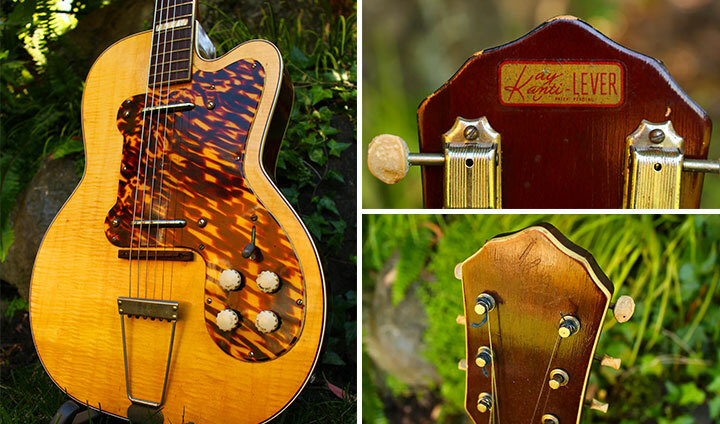 Arguably one of the finest guitars ever made by Kay, the Gold “K” Barney Kessel Jazz Special was a $400 guitar in 1959, which is a whopping $3,341 today. These awesome “K” guitars have some truly memorable characteristics, such as the “Kelvintor” headstock, the “tissue box” pickups, and, of course, the endorsement of Barney Kessel, who was a supremely popular jazz player back in the day. It seems like Barney’s endorsement ended by 1960, and these upscale Kay jazz boxes ceased production soon after. True oddities of the 1959 Kay catalog were the Sizzler guitars that came in one and two pickup versions. The pickguard and headstock designs were a departure from the more traditional Kay guitars. 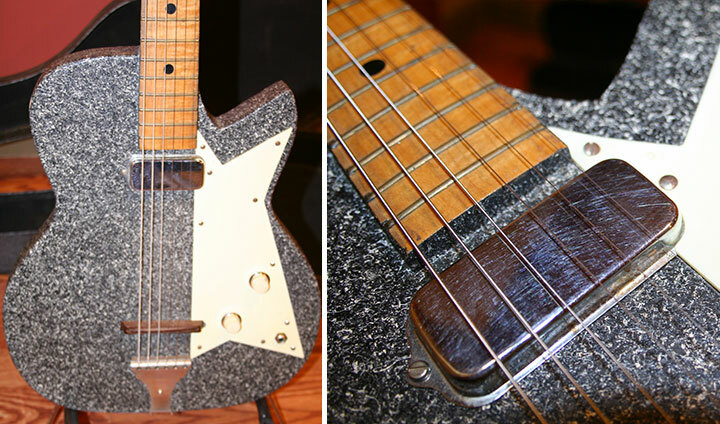 More interestingly, these guitars featured a “Plextone” finish, which is like some sort of sprayed on fiberglass. It’s hard to describe, but the finish has a unique texture that looks like a combination of a vintage art deco kitchen countertop and bowling ball swirls. The Kay Value Leaders first started appearing in 1960, and they were exactly as described: the most affordable thinline electric guitars in the catalog. The three–pickup model was called the #1963, but one and two pickup versions could be had as well. 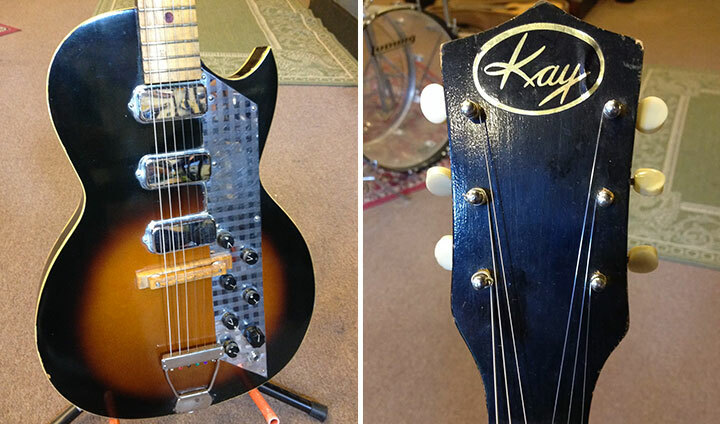 These were among the first Kay guitars to have the great–sounding pancake pickups. Historically speaking, Kay was just starting to see the import guitars coming from Japan, and the Value Leader guitars were in many ways a response to the rock bottom prices of these imports. 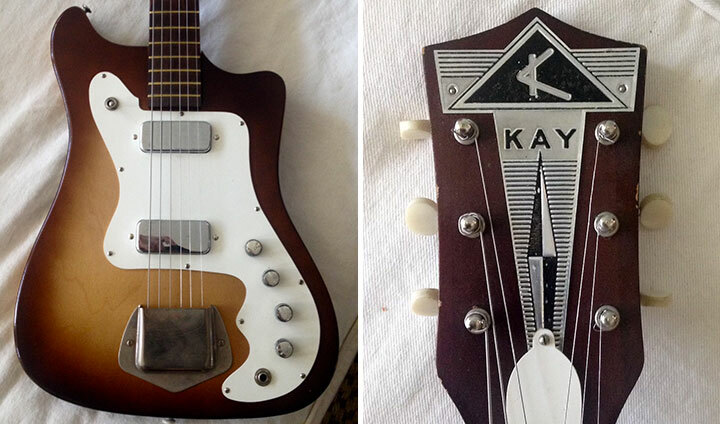 Throughout the 1960s, these Kay Vanguards were probably the most common and popular of the solidbody Kays. Featuring models with one and two pickups and with optional tremolos, these were stripped–down guitars with simple appointments and basic construction. I’ve owned a few of these, including one labeled as an Airline. The pancake pickups are riveted onto the guards, but raising these pickups with screws or shims can produce outstanding results. 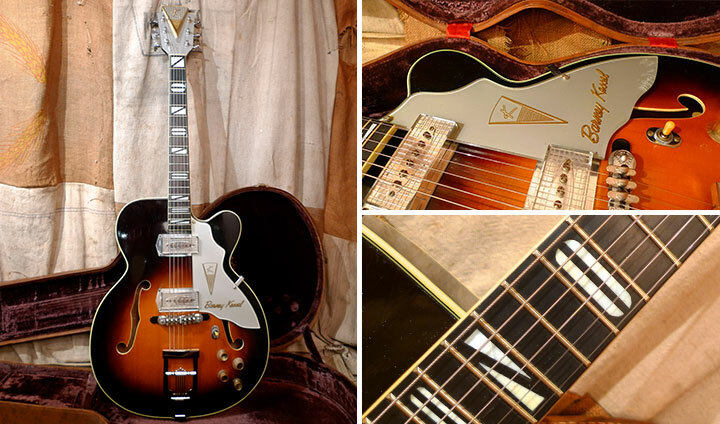 Although Kay had been producing this model in the late ‘50s, by 1962 the company had dubbed this thinline the “Speed Demon.” These are auditorium–sized guitars (40–¼” x 15”) but were only 1 ¾” thick. The pickups are often called “speed bumps,” and a three pickup version (the K573) equipped with a tremolo can really get a great rockabilly tone. 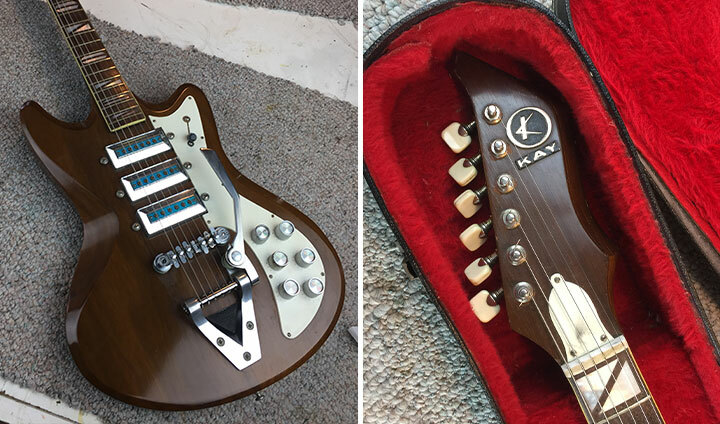 Produced at the height of electric guitar popularity in the USA, Kay rolled out the $300 ($2,415 today) Artiste (K708) solidbody in 1962, complete with “thin–lite” neck, three pickups, and a new Kay designed tremolo (a la Bigsby). This was a rather creative body design that was also featured on the two pickup Kay Apollo and Titan guitars, which were all produced until around 1968. Among the last of the American–made Kay electrics, the Vanguard II came in just about every pickup and tremolo combination available. The two–pickup K327 cost $100 in 1967 ($730 today), which was a true effort to compete with the low costs of the Japanese imports. In the late ‘60s, guitar sales were waning, and Kay was soon bought out by the Valco Company (also located in Chicago). Valco marched on for a few more years, but by the early ‘70s, Kay only existed as a brandname attached to Japanese import guitars. Frank Meyers maintains Drowing In Guitars! a website devoted to funky vintage gear. He also runs the Drowning In Guitars Reverb shop.